Abdominal belts have been around for decades thanks to our never-ending desire for a flat stomach and tight abs. Over their history, however, these belts have generally gotten a bad rap. In the early years, abdominal belts were seen by the fitness community as a ridiculous gimmick masking itself to be the lazy man’s way to six-pack abs. That image still persists in the minds of many workout enthusiasts. Over recent years, the abdominal belt has advanced in its technology. More correctly known as the electro muscle stimulator (EMS), this device has become more streamlined, more technically advanced and more user-friendly. While there are still plenty of low-quality EMS belts out there, it is now possible to find abdominal belts that do help in your abdominal workout. We have collected our top choices for you to check out. The Flex Belt promises to give your abs a thorough workout with no work required, apart from strapping the belt around your waist and flicking a switch. By sending electrical impulses to your abs muscles, it forces repeated muscle contractions which eliminates the need for endless crunches and sit ups to tone your abs. You to control the intensity of the electrical charge you give your muscles, increasing the power as you increase your training level. The more of a charge you apply, the harder and more forceful the current contracts your muscles. At the highest level, you will get a super intense abdominal burn. The Flex Belt is a streamlined black, neoprene belt. On the reverse side of the belt are three electrodes and replaceable gel packs. These are designed to sit over your abdominals and your obliques. The belt also comes with a remote control unit which allows you to control the level of resistance you give your muscles. You will feel more toned and firm muscles in a matter of weeks with clinically-proven results. This belt is manufactured by an established and reputable medical device company, Bio-Medical Research Ltd which is based in Ireland. They have been around for more than 40 years, with their products being used in medical facilities all over the world. To add to the credibility of their product, the Flex Belt has been cleared by the FDA as a Class II medical device. 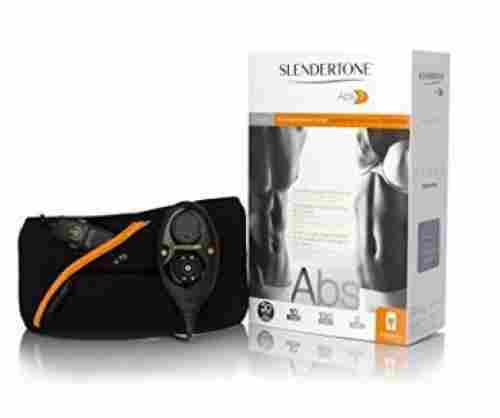 The Slendertone ﻿﻿Flex ﻿﻿Ab Belt provides an affordable electronic muscle stimulation (EMS) workout. This belt can be used by beginners or for intermediate level training. It is FDA cleared as a way to strengthen and tone your abdominal muscles without exercise. Although the Slendertone is not as powerful as the Flex Belt, it does offer a comfortable training experience for most people. This product is not for weight loss or fat reduction, but if you are looking for a way to tone your abs this belt is a good choice. The Slendertone Flex Belt offers a wide belt with a patented pad placement that provides direct stimulation to all three major muscles of your abdomen simultaneously. The patented technology has been trusted for over 50 years to make sure all of your abdominal muscles are stimulated, and you will eliminate the need to twist and turn during a workout so you can hit the different muscles. Your lower back will thank you for that. Slendertone belts are produced by the same parent company as the Flex Belt, Bio-Medical Research Limited out of Galway, Ireland. The Slendertone offers three different belt varieties. There is a men's, a women's, and a unisex belt. It does not feature a separate battery pack. Instead, the control unit is rechargeable and located on the front of the belt. You are able to set the intensity level from 0 to 99. The highest level is about the same intensity as doing a hard set of crunches. 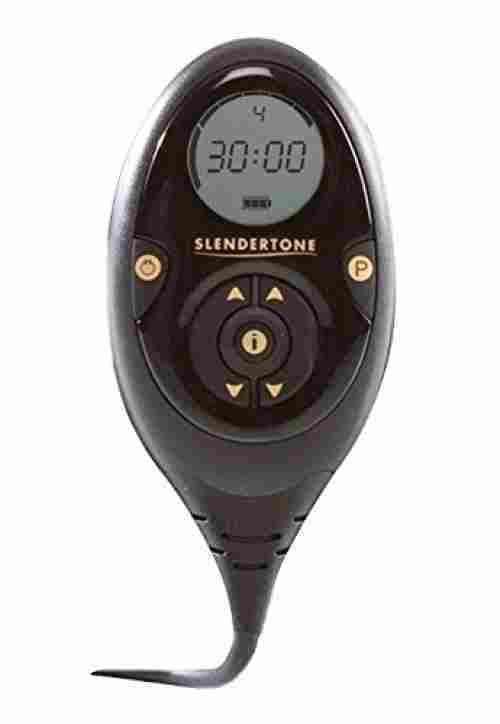 After a few months of working with the Slendertone, you will probably be ready to advance to an even higher intensity workout. This belt features 10 training programs, 3 of which are designed to work during sports activities. It also has 150 levels of intensity so you can gradually build up your resistance. Slendertone recommends working about 30 minutes a day and if you use this belt 5 times a week for 4 weeks you should definitely start seeing results. The Sweet Sweat Waist Trimmer is an extra long, one size fits all neoprene belt which is specially designed to enhance your workout. This set includes a free sample of the Sweet Sweat Gel, an all natural gel which helps to maximize your results. Rub a thin layer of the gel over your abs. Then apply the belt tightly around your midsection using the velcro tabs. This belt will help improve thermogenic activity and get you to sweat. The Sports Research Company has created this waist trimmer specifically to help you get the most out of your workout by helping your body burn sweat. The band is made of thick, latex-free Neoprene that will enhance your sweat experience. It is sewn together with durable overlock stitching to keep it from coming apart and has double Velcro which will give you extra support. The inner lining is a grid which absorbs moisture and also limits slipping or bunching during your workout. The special contours are designed to provide a comfortable fit while exercising and should always be worn loose enough to provide a full range of motion. This waist trimmer is designed for men or women to increase your core temperature and improve thermogenic activity while you are exercising. It is flexible enough to move with you so the belt will not interfere with your routine. They also go one step further for your convenience by including a breathable carrying bag so you can easily bring the band to the gym with you. The McDavid Waist Trimmer Belt has many health benefits and can be an important part of your weight loss program. It is designed to fit most figures and can be worn under or over clothing. The non-slick neoprene inner layer holds it in place during your workout. It closes with a hook and loop so you can get a custom fit for your body size. It provides a cushion, comfort, and support for your back and abdomen. This belt is so easy to put on, you will enjoy the convenience. If one of your goals is to trim down your waistline during your workout, this waist trimmer belt will be a healthy assistant for you. The McDavid belt gives you good core support during your workout while it generates therapeutic heat for your back and abdomen. It helps give you a healthy sweat which burns fat. You will see encouraging changes in your entire midsection as the belt helps to remove excess water weight. It will also help to improve your posture and can provide your back everyday support. The McDavid waist belt is made of high-quality latex-free neoprene for good thermal therapy with less chance of skin irritation and soft tissue support with a thin inner layer which will help prevent the belt from slipping while you are doing your workout. The best part is, while you are losing weight this belt will still fit because it has an adjustable velcro strap you can adjust to your current size. Wonderience has created this vest for workout enthusiasts who want that extra help getting rid of water weight. They call this the sauna vest because it will definitely get you sweating. This vest is designed to keep your body warm during cold days and has the advantage of covering your entire abdomen and back at once. Slip it on under your regular shirt. This vest will help burn fat while you are working out or just going through your day. This sleek body shaper is designed to enhance your workout and give you a head start in your weight loss program. The scientific design will fit your body just right. It is made of neoprene with a durable zipper which makes taking it on and off so much easier. The fabric will warm your body core and collect body heat to make you sweat and help burn calories. The design of this vest will also help to correct your posture and ease pressure off your lower back. You can develop a flatter, firm tummy and get rid of those stubborn love handles. Wear it while lifting weights, doing aerobics, jogging, or during any sport or activity when you are wanting to lose some water weight. Some people even sleep with it on. You can sweat out those harmful fats while enhancing abdominal and spinal support. You will feel the difference in your lower back. Fitru says it is time to Ready, Sweat, Go! This is their highest quality waist trimmer made of latex-free neoprene in a wide and thick design. This belt is made with high quality, durable fabrics and a strong fastener which will not come undone during your exercise routine. The belt itself is black but comes in a choice of five different trim colors including black, blue, pink, red, or yellow. This belt will fit your workout and your style. The Fitru Waist Trimmer is a high-quality ab belt which can be worn by men or women. This belt boasts superior craftsmanship made to stand up to abuse using the strictest quality control in the industry. Many of these belts fall apart after just a few weeks of use, but this one will not. Fitru also uses the best technology with their anti-slip grid on the inside of the belt to prevent slipping, bunching, or moving around during your workout. The belt is contoured to fit your shape and designed to repel moisture to prevent sweat or bacteria build up. Wraps it around your abdomen to retain heat and increase your core temperature which will enhance thermogenic activity and sweat. It helps you shed extra water and toxins. This belt is made for comfort as well with light-weight materials that conform to your figure while supporting your abdomen and lower back. There is also an added benefit of helping to improve your posture and creating therapeutic heat which will help to relieve back pain. It will help protect your back and prevent injury. Reformer Athletics has created this waist trimmer belt with an extra convenient feature. It has a handy impact-resistant sleeve you can attach anywhere on the belt to provide a safe place for your smartphone during your workout. This attractive, easy-to-wear belt is designed to fit snug on male or female figures. It also comes with a collection of ebooks and will definitely enhance your workout. The Reformer Athletics waist trimmer belt is 8.4 inches wide and 46 inches long, made to fit men or women so it is designed to cover your entire abdomen. The belt itself is made of sturdy 100 percent latex-free neoprene and creates a sauna around your waist, warming your core which helps with your circulation and helps you to sweat out toxins and burn off calories. This waist belt can help victims of back or spine trauma. You may also find it helpful if you are experiencing back pain or posture issues. It can give your body extra support if you are having to stand up for an extended period of time by providing abdominal compression and lumbar support. It cushions and supports your lower back. This belt is made with new high-quality, three-dimensional structure neoprene that was developing to enhance good breathability and shape support and the adjustable velcro will keep it in place no matter what your waist size is. The belt also comes with two free ebooks, one with smoothie and protein shake recipes and one filled with nutritional recipes book. The TNT Pro Series belt was created with a focus on durability. It can be worn by men or woman and works as a fat-burner wrap. It is versatile for many different waist sizes. TNT Pro Series has so much confidence that you will love this waist trimmer belt, the belt comes with a one year guarantee. This belt is made of durable premium material which will repel moisture and stop smelly bacteria buildup. There is also an interior grid on the material surface to keep it from sliding around while you are working out. TNT Pro Series considers this the highest quality in waist trimmer belts. This belt is wide enough to cover your entire abdomen while being sleek enough to be worn under clothes if you choose. The thermogenic effect helps to promote weight loss, improve your circulation, energy level, and recovery. They recommend that you measure your stomach at the belly button to get the most accurate numbers for sizing. Even if you have a larger stature though, this belt fits well and is sturdy. The belt itself is black with lettering in a choice of either pink or yellow. Slimming is the main purpose of this belt but it also offers extra support and compression for your lower back which will help you develop your athletic side while minimizing soreness and back pain. TNT Pro Series products are built with the highest quality in mind and they are made to last. They also promise stellar customer service by either resolving your concern or providing a full refund. This belt is super comfortable while doing a great job of really making you sweat. The Bracoo Company works to combine innovative technology with the finest materials available. This waist trimmer belt was created with that philosophy in mind. The belt easily contours to your figure, male or female, and covers your entire abdomen to effectively warm your core and help with your workout or enhance any physical exercise. This belt is easy to wear and gets the job done by helping you work up a good sweat. The Bracoo Waist Trimmer is a quality neoprene sweat belt which will insulate your core and raise the temperature. That heat provides a good sweat which also increases your heart rate and helps you to burn calories faster. It will help you shed excess water weight and increase your metabolic rate. This belt is designed to stabilize your core with mild compression so it reduces excessive motion and helps reduce muscle injuries from them cooling down between weight sets, drills or exercise routines. It can be used indoors or outdoors as well. During more cardio activities like jogging or cycling, the tactile inner grid will keep the belt from slipping. It is lightweight and fits comfortably under your clothing. The belt has superior grip straps and will be easy on your skin, odorless and completely non-toxic. It is designed to fit up to a 40-inch waist, hugs your figure, and is easily adjustable as you lose those inches. Wear this belt directly against your skin for the best performance and work to target those core muscles while providing support, and reducing fatigue and strain. When it is time to wash, just hand wash it in cool water and hang it up to dry. The Perfotek Waist Trimmer Belt has shown proven results with before and after pictures from satisfied customers. The Perfotek comes packaged in its original tube. That is how you know you are getting the genuine product and not a knock off. This is the portable sauna for your core muscles, designed enhance your aerobic workout and support your lower back. Designed for the male or female figure, this waist belt is a quality abdominal trainer. The Perfotek waist belt comes in black with trim in either pink or yellow. This belt will help you build a strong body core by stabilizing your entire body. A strong core gives you better balance with a healthy posture, easier breathing, and helps to improve your circulation. This belt increases your body heat and sweat level so you can target that stubborn belly fat and water weight. At the same time, the light-weight material prevents heat stroke. It is designed to be used along with your collection of other workout equipment. This belt is adjustable up to a 42-inch waist so it is made to snugly fit a wide variety of body shapes and sizes. It is also adaptable to almost any workouts or aerobic activity and is wide enough to cover your entire abdomen area. The rounded double stitched edges help to provide comfort and durability. It is thick enough to warm your core and also keep its shape. The blend of neoprene, nylon, and polyester form a tight bond with the velcro fastener and is so comfortable you will almost forget you are wearing it. It probably goes without saying, when you are shopping for a waist trimmer of any brand one of the first things you will want to consider is how easy it is to use so you can get on with your workout. If you are shopping for something like The Flex Belt which offers an EMS workout for your muscles, you will want one with a belt that is easy to put on and includes a convenient charging system, controller and silicone pads. The standard waist trimmer belts should be easy to wrap around and fastener, easy to adjust if needed and easy to take off. You want a belt you will not have to focus on in any way so you can stay focused on your workout. Depending on how often you workout during the week, your waist belt will get a lot of use. For this reason, you will want one which is made of the highest quality materials. Neoprene is very popular with nylon or polyester sometimes being used as well. The stitching on the belt is important too as you want one which will withstand fraying or tearing even during a long workout or while you are handwashing. Double stitching is available on some of these products. Look for a waist belt which will stand up to stretching while still keeping its shape. You should also take note of the way it is fastened, making sure the fastening area is secure and will stand up to plenty of pressure and use. You will want a fitness belt which can be taken with you wherever you choose to workout. Will it easily fit in your gym bag? Can you just leave it on under your clothes? Would it fit in a handy bag or, if it is an EMS trainer, does it come with a bag you can carry all the parts in like the remote and controller? Look for a belt which will roll up easily and be able to unroll ready to be worn, one that will not get all tangled in the rest of your gear. When thinking about what features to look for, keep in mind what kind of exercise you will be doing most when you are wearing your waist trimmer. If you are not as physically fit as other people and tending to do more walking or light exercise, you might get more use out of the EMS trimmer belts which emit an electrical charge to make your muscles contract and exercise. These belts are also helping if you desire pinpointing your specific muscle tone instead of the sweat therapy in general. If you are more focused on weight training or something similar, you will want to look for a belt which has plenty of abdominal coverage so you can enjoy the added benefit of having back and abdominal support. The belt can help to keep your muscles warm between sets which will help you avoid injuries. If you are into cycling or jogging, you will probably want to set your sights on a belt which is specially designed to stay in place during lots of movements. You may also want one which you can wear easily under your shirt for the best results. This criteria is extremely important. If your waist trimmer belt is not comfortable, you are not likely to wear it on a regular basis. You will want a belt which is flexible enough to conform to your figure, but also firm enough to offer the best support for your back. The belt should be thick enough to provide a good sweat while also being made of breathable material so you will not be in danger of overheating. The fastener should be strong enough to hold the belt in place without rubbing against your skin. Speaking of skin, you will want to pay close attention to the inner surface of the belt since you will be wearing it directly on your skin. You want to look for a material which is soft enough to avoid chaffing but something which has a good texture so the belt will stay in place. If you have sensitive skin, you will also want to be on the lookout for any material which may cause a rash or adverse reaction if worn for too long. q: Why does the FDA regulate EMS (electrical muscle stimulators)? The electrical muscle stimulators are considered devices under the Federal Food, Drug, and Cosmetic Act. Most of the devices reviewed are for use in physical therapy or rehabilitation with a medical professional so if the companies want to sell them directly to consumers they need to show the device can be used safely and effectively by them. q: How do I measure myself to know what size of a belt I need? You will want to measure your abdomen right at the belly button. Then follow the charts provided by the manufacturer to determine what size of a belt will be best for you. q: Will a waist trimmer really help me lose weight? Be sure you know what to expect and be leery of the company’s promises. A waist trimmer belt will raise your core temperature which should help you burn more calories> The one thing they do is make you sweat which, at the very least, will help you lose water weight. They will also help protect your back while exercising.